One of the greatest pleasures in writing CD reviews for Rough Edge is the discovery of great bands I may not have ever heard of otherwise. Shango was one such band, as was Pressure 4-5 and many others. Escape From Earth is the latest to join that esteemed group. What immediately caught my attention was that three of the five tracks on "Escape From Earth" are produced by the legendary Bob Ezrin, who has worked with such legends as Pink Floyd, Alice Cooper and KISS. 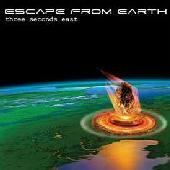 As much as I admire Bob and as outstanding as his production work on this CD is, I am pleased to announce that - stellar production aside - there's more to Escape To Earth's "Three Seconds East" than having a living legend pushing the buttons. "Three Seconds East" begins with "Yesterday," a tune that seems to combine the styles of Disturbed and Creed. It's a solid rocker with a strong melody and a killer chorus. The guitars are solid throughout, the songwriting spectacular and the band tight. "Beautiful" is up next and, although some may find its smooth melody a little too sweet, it's perhaps the best song on the CD, rocking with power ballad muscle and pure emotion. The final Ezrin-produced track, "One Thing or Another," pales a bit compared to the previous songs, but builds into a strong number of its own. If you thought the high production values were going to stop when Ezrin stepped back and let bandmember Chris Sernel and Rae Dileo take the lead, you're in for a surprise. "Never Hear" is up next and is highlighted by a wall of guitar sound that would sound awesome live and a uniquely harmonic chorus that is irresistible. The final track, "Without," doesn't disappoint either, featuring more of those "wall-of-sound" guitars and a hook-laden verse and chorus. Escape From Earth are in the perfect position to take the rock'n'roll world by storm. "Three Seconds East" is hard and heavy enough to please fans of heavier rock and melodic enough to generate decent radio airplay. In addition, I can see virtually every song on this CD fitting into the current wave of rock'n'roll movie soundtracks as well. Mark my words - this band is going places. ESCAPE FROM EARTH: Chris Sernel - vocals, guitar; Christopher Castelli - guitar; Andy Ahn - bass; Paul Castelli - drums. For more information, check out http://www.escapefromearth.com.